marek wrote: For starters, Chicago is my west conf favorite team and my original post/thread was made on April 19th after watching them squeak by a depleted Nashville team in OT. I never said they sucked. I said they weren't that good. HAving Ray Emery in net is pretty much all that needs to be said to justify that comment. At that point they were being touted as "unbeatable" and a lock to win the cup. Being on the west coast and having to watch a lot more western conf games than most posters on here, it was more or less a statement that they were far from that. Interestingly after my post they went on to lose 3 of the next 5, with the two wins coming against an already mailed in Calgary and Edmonton teams. They didn't face Anaheim in the playoffs (btw they swept the Hawks during the season). They didn't face Vancouver (their fiercest rival - 2 losses against them and one shootout OT win). They faced Minnesota instead of Columbus (who would have given them a better series - as 4 of 5 games this season vs the jackets were one goal games, SO or OT)... and Bobrovsky was playing out of his mind. They were lucky to squeak by Detroit in a game 7 OT thanks to typical NHL officiating... yes you can blame that series on the officials. and they faced a highly over-rated "reigning" champion LA Queens - who followed up the short summer off in typical "Flyer" fashion. They're record will be inflated next year too. Not because they are unbeatable, but because they'll have the luxury of being in the weakest division in hockey, but you never know as they will have to face eastern conference teams. So i'm curious to see how that goes. Congrats Chicago. Crow tastes really good. But you enjoyed plenty of fortuitous bounce, more than most championship teams get. marek wrote: I still stand by the original comment. Better than the Isles, Oilers, Pens of dynasties past... LOL... yep WAAAAAAYYYY better. Digitalgypsy66 wrote: Yeah, I just don't see any rationale for saying the Hawks aren't good. None. Oh, good. I didn't say anything stupid. At least in this thread. I don't use this often, but LOL. Give me a break. After your "GLOVE HAND CRAWFORD LOL" post, claiming that the Hawks are your "favorite team" in the Western Conference is **** lulz. shafnutz05 wrote: I don't use this often, but LOL. Give me a break. After your "GLOVE HAND CRAWFORD LOL" post, claiming that the Hawks are your "favorite team" in the Western Conference is **** lulz. I like the LA Queens joke. How are they like the Flyers again? Is it because they have Mike Richards and Jeff Carter...the seemed to be the biggest issue that Philly ever had....oh wait, they have a ring the rest of the Flyers don't. So, that comparison makes 0 sense. Fixed - I would have gone with this approach instead. ray emery was like 17-1 this season. 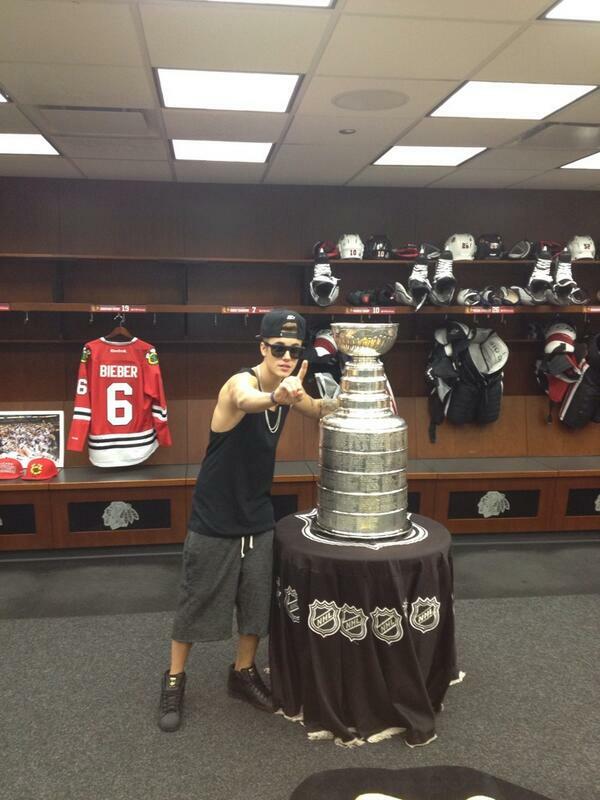 The Blackhawks won the Stanley Cup. That should end this thread. rosey6629 wrote: The Blackhawks won the Stanley Cup. That should end this thread. I'm keeping this baby alive until the next 'Cup champion is crowned. Lesky has "Jagr to Philly"
FreeCandy44 wrote: EPP is my hero. marek wrote: Easy division. Shortened season. Weak conference. Can barely beat Nashville on home ice. Uses easy division and weak conference to save it up for the playoffs. Dominates. Yeah. But they coulda won it better. Cousin just sent me this. I don't know how you can make so much money and then still want to dress like a hand-me-down thug. Does the kid just follow around all of the championship teams and acts as their number 1 fan? No, he's doing them a favor by gracing them with his presence. Considering he was basically the male equivalent of Hannah Montana when he started his 'career', he has to overcompensate with his image to be taken 'seriously'. Unfortunately (for him) it looks as if he hasn't hit puberty yet and no amount of snapbacks can fix the fact that he looks like a 12 year old who just raided his 18 year old brothers closet.